Malware refers to software that “junks up” your computer and does annoying and malicious things like launch popup windows, sends spam, or redirects your web browser. Malware is similar to a virus, but often has a profit motive and relies on user deception rather than security flaws to run on a system. In the last video I talked about a some ways that website owners and software vendors use to make money from you on the Internet. The reason I described them is because the methods folks use to make money have a direct effect on your Internet experience. Some of these methods are obvious, others hide behind camouflage and masquerade as something they’re not. Some of the methods are completely safe, and others are very dangerous. Unfortunately it’s not so easy to tell what’s what on the Internet sometimes. So in this video we’re going to exploring the first money-making method that I talked about: donation-based sites and services. I’ve got some very good examples to show you along with some important lessons to learn along the way. The first example is Wikipedia. You’re probably heard of Wikipedia but if you haven’t, it’s a free online encyclopedia that’s updated by its users and a panel of expert editors that keep the content authentic, accurate, and well-cited. Wikipedia is also completely donation-based. So let’s check it out. I’m going to open a web browser and go to www.wikipedia.org, and when I get there I need to select my language. Once I’m on the home page for Wikipedia I’ll notice that there is no obvious page content asking for payment and no advertisements. Well if I look close enough I can see a “Donate to Wikipedia” link on the site’s main navigation. They also have a “Wikimedia Shop” where you can buy Wikipedia branded merchandise. Let’s click on the donation link. What we see is a pretty typical Donation Page: it has a brief message from the Wikipedia founder calling you to action, and it has a form requesting a donation amount and donation method. A Call to Action from the site’s founder. Obviously mileage may vary, but these are features to look for when you’re trying to decide if a website is donation-based and whether or not it’s actually safe. Next let’s look at Kahn Academy. Kahn Academy is a free online learning tool. It’s not as old and entrenched on pop culture as Wikipedia, but Kahn Academy is still a very well-known and highly regarded resource in its own right. If we go to the Kahn Academy website, we can immediately see how they get their funding: the big Donate tab on the top-level site navigation. If we click that link we see a page very similar to Wikipedia’s: No ads, a donation form, a Call to Action from the site’s founder. What’s more is that Kahn Academy prominently displays their IRS Non-profit status. While many free sites and services won’t have non-profit status, it’s certainly another item to add to the list of evidence for a site’s legitimacy if they do. Finally, let’s take a look at Camstudio. Camstudio is a free screen recording tool. It’s completely free and donation based, but there are definitely some lessons to learn from the website and how the author presents their software. If we search for Camstudio the first thing we’re going to notice is that in addition to the official website, there are dozens of “free download” sites also offering the software. Now you’ll notice this for just about any software that you try to download from the Internet and it doesn’t say anything about Camstudio’s legitimacy that there are multiple download sites. But what you need to remember is to always download from the official site when possible. Let me show you why. In the video you’ll see me click the link to download Camstudio from a download site called Softonic (I’m intentionally not providing a link to it). I immediately notice a giant red flag: multiple, intentionally confusing download buttons. Eventually I just pick a button and it begins downloading a “downloader” for Camstudio. A downloader is a program that downloads another program, and often a bunch of other junk along with it. The Softonic download installs several junk programs on my computer along with Camstudio. The PC Optimizer application that it installs obviously lies to me about the problems its finding with my computer, then wants money to install these imaginary problems. So now that we’ve explored an alternative download option and discovered why you should avoid them, let’s go to the official website. You’re immediately going to notice the Donate button, but we’re also going to notice that the site serves advertisements as well. Generally these ads are safe, but during my testing I found some ads that were not that resulted in ad-ware being installed on my computer. I’m not mentioning any of this to pick on Camstudio: it’s a quality product. But be aware that some sites and some programs will “mix-and-match” their revenue streams and understand that even a free, donation-based product can pose problems if you click and install without thinking. In the video I click a suspicious advertisement on Camstudio’s home page. The ad runs a downloader called InstallIQ which installs Camstudio as well as RealPlayer, Google Chrome, Google Toolbar for Internet Explorer, and another PC Optimizer program. Once again the Optimizer lies about computer problems that it detects and wants money to fix them. Finally lets click the official download link and show you what a regular installation looks like. In the video you’ll see that the official download for Camstudio takes just a few seconds. After checking my desktop, Start Menu, and Control Panel I’ve verified that nothing installed other than the program I wanted. The downloaded file is a “downloader”, not the actual program. 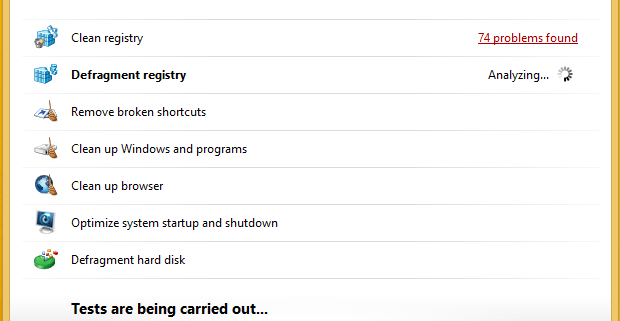 The downloaded file installs any sort of Registry Cleaner/PC Optimizer programs. They’re almost always bogus. Now that we’ve seen some examples you can identify donation-based software and services, you should understand that some websites use multiple revenue streams, and some donation-based programs can still be problematic if you download and install them without thinking. In the next video we’ll explore some more money-making schemes you might run into on the Internet, and how you can avoid them. Catch you later! I’ve blogged about this all the way back in 2008 but since FakeSecScan continues to be one of the most prevalent virus infections out in the wild (and thus a big source of income for tech support professionals like me) I decided to revisit it. How do you get rid of FakeSecScan? Let me save you some time and money. Download the free version of Malwarebytes Anti-Malware. Boot into safe-mode, install and run it. First you’ll need to download MalwareBytes Anti-Malware. If the malware is blocking you from downloading it, you’ll need to use another computer to download it. While your at it, download the latest updates for Malwarebytes as well. Boot into safe mode (press F8 when your computer boots). Install MalwareBytes and the updates you downloaded in step 1. Run a Full Scan with MalwareBytes and remove anything it finds. Your system should be clean now. Here’s how to keep it that way! Install a quality Antivirus package. Prefer MalwareBytes Anti-Malware and Microsoft Security Essentials. Regardless of what Antivirus package you choose, don’t just install it with it’s default settings and ignore it. Explore it. Tweak the settings so that it is performing daily updates (so it can recognize new viruses) and full scans (so it is actively searching for them). Also I recommend having it automatically clean, quarantine, or delete all but the lowest level threats. Get to know what your antivirus software looks like, and never again click “Save,” “Run,” or “Open” to an antivirus program that isn’t the one that you installed yourself. In fact never click “Save,” “Run,” or “Open” to anything that you don’t recognize. You see this video? Learn to recognize what fake antivirus malware looks like and how it behaves, then avoid it! In the last few weeks I’ve worked on more than a dozen computers infected with some varient of the “Win32/FakeSecScan” virus which sneaks onto your computer by pretending to be legitimate antivirus software. In an effort to help my clients avoid the headache and cost of a cleanup, I wrote this Beware of Fake Antivirus Programswhich describes how to identify and avoid the FakeSecScan virus. Feel free to Beware of Fake Antivirus Programs!